I recently bought an Ellowyne doll and I have been itching to sew for it. 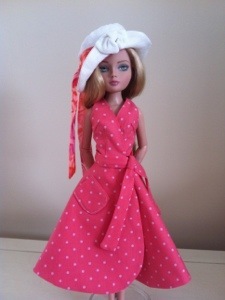 The Ellowyne dolls are actually a 16″ fashion doll. Fitting them is so different than American Girl dolls because of their curvy figure, but I was up for the challenge! 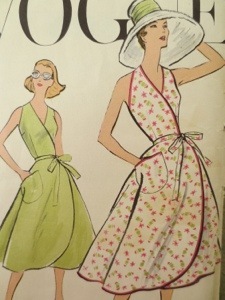 I started with an inspiration photo from a Vintage Vogue pattern. I liked the flared skirt. I started pulling different fabrics and textures together from my “stash”. I used 100%cotton for the dress. The hat and jacket are white linen, and the sash on the hat is made from a bright and colorful chiffon. Everything that can be lined is lined. There’s still more to do. 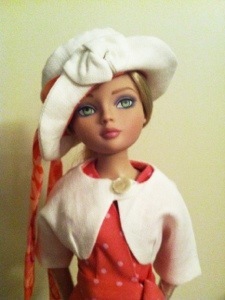 I haven’t decided on stockings yet and I’d like to embellish the jacket and hat with glass beads. Does anyone collect Ellowyne? I would love to hear from you! ← New Ballet Flats ! I just started sewing for Ellowyne a few months ago! 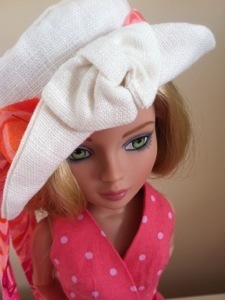 I like her because she’s bigger than a Barbie but wears “adult” styles (I usually sew for American Girl dolls). I’m constantly on the lookout for new patterns for her. Your “Wednesday Bridge Club” is so cute! Thank you Mary Ann! I like designing for Ellowyne for the same reasons you like sewing for her. Stay tuned for patterns! That’s great – can’t wait!